Last time we spoke, it was raining cats & dogs. This time we’re coming out of the 2017 Ice Age. And you might be thinking to yourself, “Man-o-man, with all this inclement weather, I bet log prices are really doing their thing.” Well, they are doing their thing, just as they always do around this time of year. Bad weather. No access. Low mill inventories. Speculation on the upcoming building season. All of the above should factor-in to some pretty decent log values. Yes, sort of, but then again, we say the same thing year after year and we’re pretty-much right year after year. Log values peak in the late winter/early spring, then we witness the inverse correlation between more sun and loggers versus log values. And again, they pay us to tell you these panegyric prognostications. But you’re not interested in expanding your vocabulary… show me the money! First up-to-bat is Douglas-fir sawlogs coming-in at about $675-$700 for small diameter long logs. That’s up a little bit from our pervious report. These values have been relatively consistent for the past few months. The #2 sawlog brings another $25-$50: the better the quality, the better the price. Even though we see marginal increases in value for the larger diameter log, remember the logistics of moving these logs. Bigger logs means more scale means less work means more money. Keep this in mind when a logger or log buyer or anyone interested in your wood tries to convince you it isn’t worth holding-off on your harvest ‘cause the bigger wood isn’t worth more money. Buffalo chips! It may not be a lot more at the mill, but it sure as the dickens will be cheaper to get it there. And if it isn’t, you’re talking to the wrong logger. 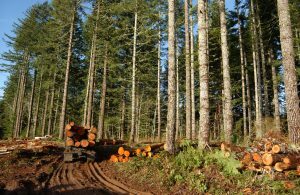 Historically, whitewoods are valued approximately $100 – $150/MBF less than Doug-fir. At the current time, I’d say those margins have increased somewhat with these logs being valued in the mid $500/MBF range. And remember, the bigger the log (unlike Df) the more difficult it will be to sell it. One of the reasons for this phenomenon is that mills don’t get the overrun out of these larger logs (less taper, more defect). 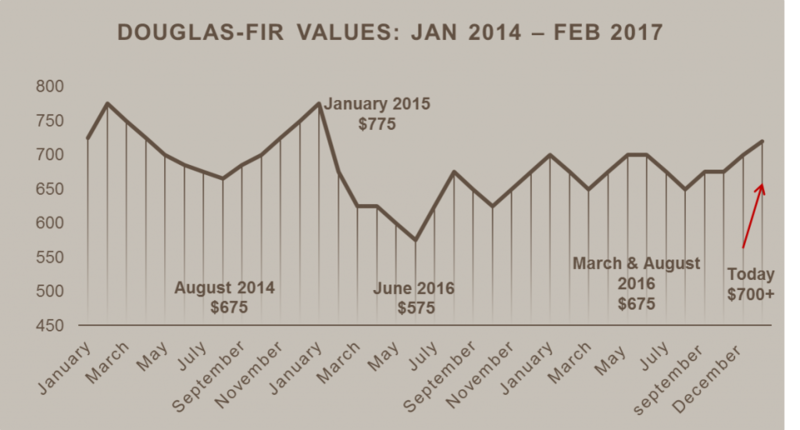 Red alder values have increased somewhat since our last report. Camp run values are running close to $600/MBF. If you sell on diameter, you’ll get less for the smaller material, but then-again you’ll get substantially more for the larger log. The 8” – 9” sort is a fairly common size and for these logs, you’ll see that $550-$600 value. For the weight aficionados, a $600 log should be in that $80-something/ton range. Hardwood buyers are actively seeking these logs at the current time. Redcedar logs have been strong, are strong, and will likely remain strong. Today, due to the lack of infrastructure in our area, top dollar requires they be shipped to Washington. Actually, even when we had the mills, the big money has always been up north. Redcedar long logs (36 & >) will bring you around $1300 at sort yards east of Eugene and west of Corvallis. Your decision is whether to pay more for trucking and try to make up the difference in $/MBF. Personally, that’s a pretty close call and all things considered, I’d d stay close to home. Chips. Why do people continue to request these values? And we use the term “value” rather loosely. Local buyers are paying about $26-$27/ton for conifer chips. We’ve said it before and we’ll say it again, chips should be considered a residual from a timber harvest. A decision that you might want to give some thought is the chip & saw material. Basically, this type of log is a miniature replica of a merch sawlog. Buyers don’t want defect (particularly sweep and crook). The primary difference is they’ll take logs down to a 3 or 4” top and pay by the ton. If you can find a buyer relatively close to you, you’ll see these types of Df logs bring over $60/ton. As a merchandiser, the question becomes whether to utilize the entire merch stem of a tree (down to a 5” top) and sell the rest as low value chips, or do you keep scaling diameters at 7” or larger and then utilize the stem down to that 3 or 4” top. The remains of this strategy will likely stay on the landing or go as firewood. Your call. Export values are basically on-par with domestic prices, but remember, you need long-logs and somewhat larger diameter requirements. A larger, cleaner 2 saw log is the one folks are seeking (scaling diameters in the 15” – 20” range). But all-in-all, it is tough for them to compete with local mills if in proximity to the harvest operations (trucking trumps any increase in value). And we said it last time: there’s a good chance the closest mill will be the best mill. Poles are holding steady. In our last report we stated, “Poles less than 70 feet are bringing in the $800+/MBF range and 70’+ material is just under $1000. Remember, there is some competition in the pole market, so make sure you check them out.” Mr. and Mrs. Reader, I stand by my previous statement. Oh wait! Before we go. There’s a new show in town. Alder chips are now being sought in the Douglas County area. Make sure you check-out the piece in the newsletter for additional information. In summary, values are pretty good now, but I wouldn’t hold-out for more. If you look at 30-year historical values of Doug-fir, things (excluding the Great Recession the past decade), values haven’t really changed all that much on an annual basis. So market timing is more a function of predicating your harvest decision on the time-of-year (short term) versus the year itself (long term). So good bye and good luck. A load of logs on its way to the sorting yard from a logging site in the coastal range near Blodgett Oregon. Photo by Lynn Ketchum. ~ by grandl on February 15, 2017 .